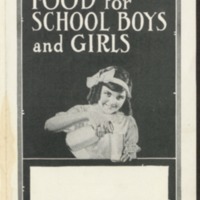 Food for school boys and girls : the menus here suggested have been prepared by the Boston Dietetic Bureau. Menu suggestions for breakfasts, dinners and suppers were common tools of handling nutrition issues. Prepared by the Boston Dietetic Bureau, the menus in this pamphlet are directed towards mothers. Highlighting the importance of meals in a simple, visually engaging way, mothers are also advised to provide mid-morning and after-school lunches for children. Includes "Plan meals like these", suggested meals for breakfasts, dinners, suppers. On back cover, "The eight health rules", within a graphic showing a milk bottle and elves. 4 pages : illustrations ; 19 cm.